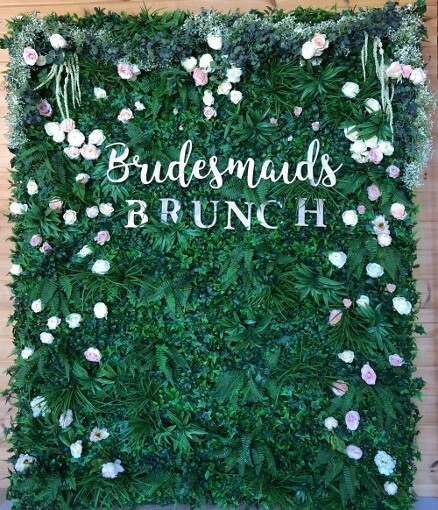 All our wedding backdrops are handmade by us and are totally unique. 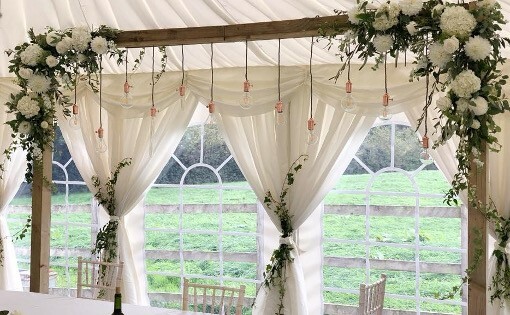 Our rustic frames can be placed at the top of the Aisle dressed with beautiful flowers, placed behind the top table as a feature behind the bride and groom, place your cake inside/underneath, or used to divide an area in a large venue. 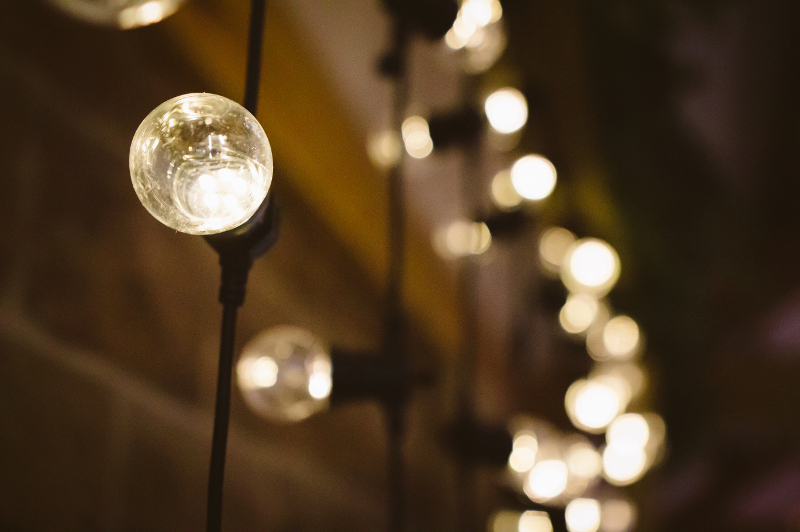 Venue lighting is so important and we offer something different as a focal point. Rustic Frame w/ Hanging Edison Bulbs. 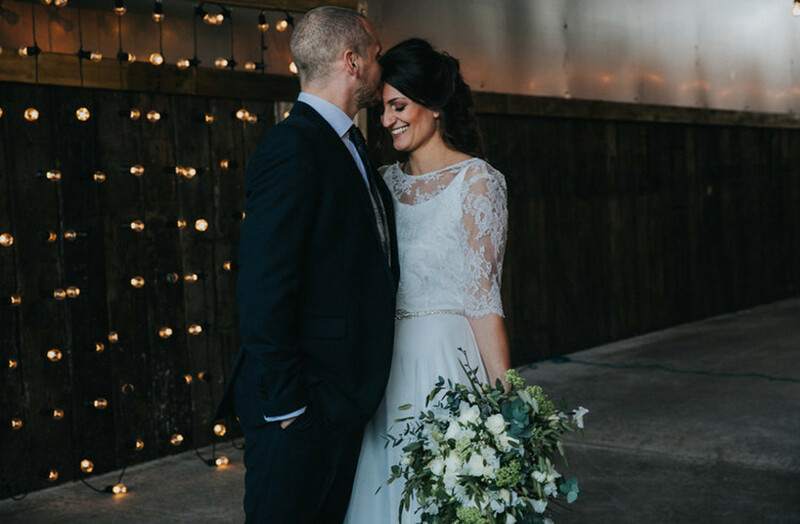 This unique, versatile and stylish wedding backdrop offers a rustic alternative to the starlit curtain backdrops. This cleverly designed wooden frame can be placed behind a top table or against a plain wall to create the perfect setting for your vintage love letters or romantic wedding breakfast. With the lights hanging from a rustic timber frame it can be perfectly placed behind the top table, or if you are having a love bird table then two can be placed over. 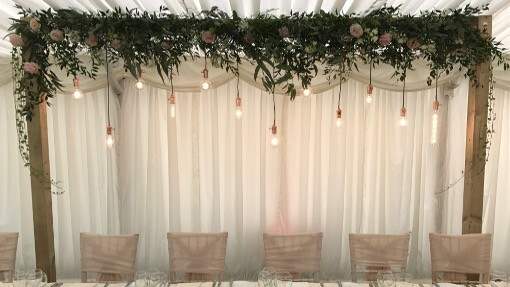 The grey and copper hanging lights create the most romantic atmosphere for a classic or rustic wedding, the modern unique twist your wedding might be missing! Metal plate feet for stability that we can decorate with burlap if you wish. Accessorise with our faux flower foliage garland. Available in Multi Colour or Grey with Copper. Classic White Frame w/ Hanging Edison Bulbs. This Classic Clean Fresh White look is a modern take on the traditional curtain. Our Unique Hanging Edison Frame uses White cotton hanging wire with LED Edison Bulbs and Chrome Bulb holders. Perfect for your white wedding. 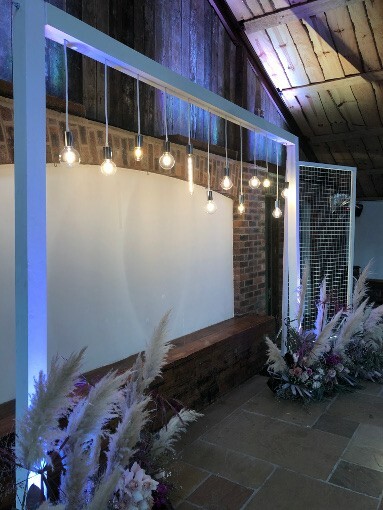 RUSTIC FRAME WITH FULL FESTOONS. A true Pinterest inspired design. 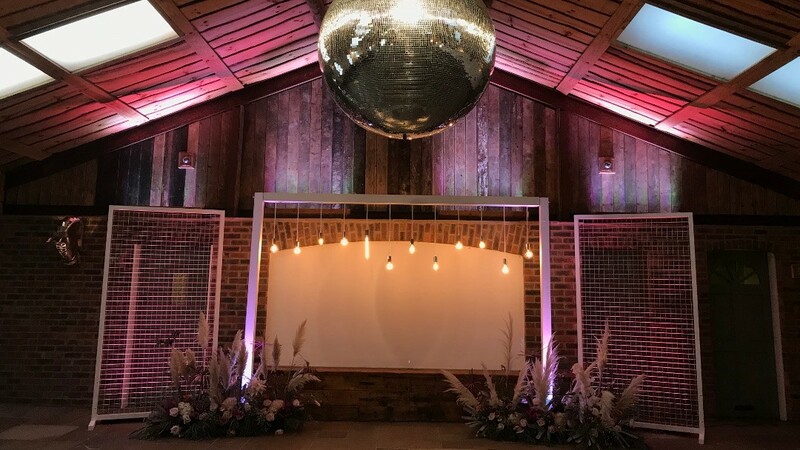 Our full festoon light backdrop showers bulbs all the way to the ground, it’s romantic and lustful, share your first kiss in front of this light bulb curtain at your ceremony or place it behind the top table. 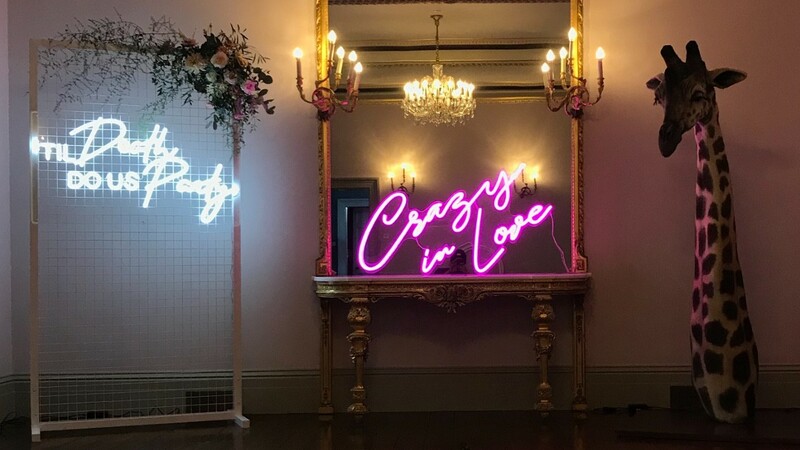 Or why not get even more creative and use it as a backdrop to your DIY photobooth, wedding cake table or to bring a blank wall or dark corner to life as guests will always pose in front of it for amazing photos! 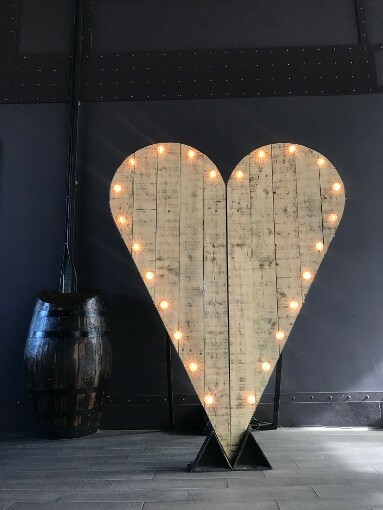 7ft RUSTIC HEART Illuminated Backdrop. We’re giving big love to our Big Rustic Heart. 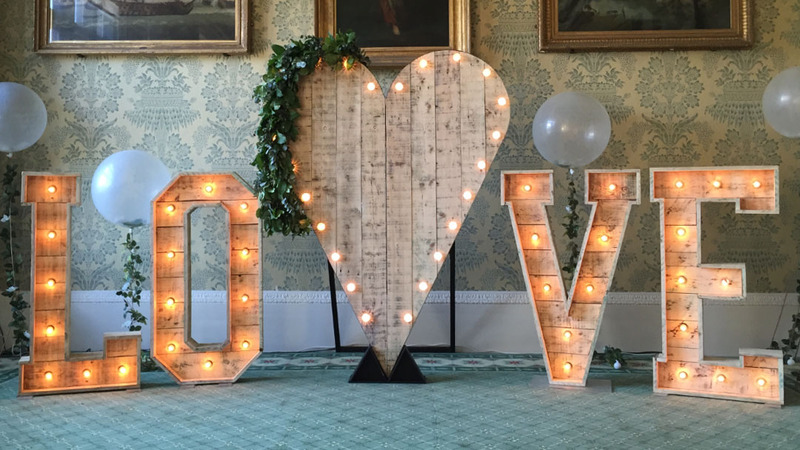 To compliment our rustic love letters we have created a beautiful rustic heart that stands an impressive 7ft high. 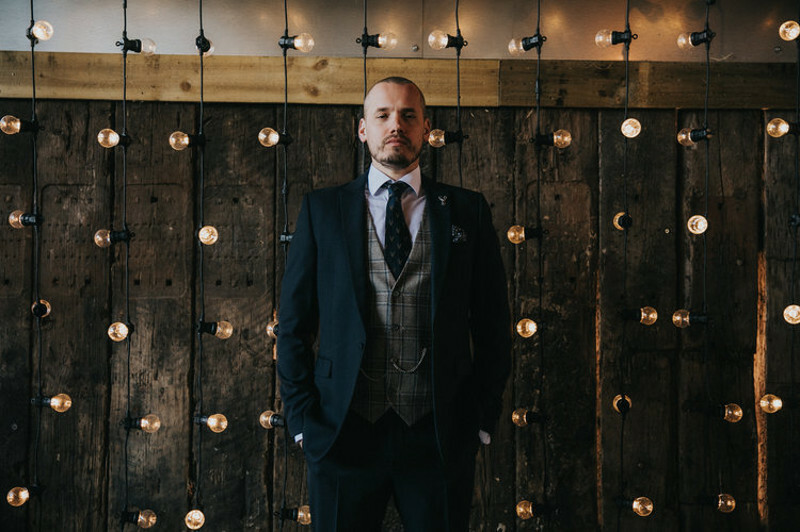 Using the same reclaimed timber as our letters and edged in steel with stud detailing this one off backdrop is a real centrepiece for your ceremony. 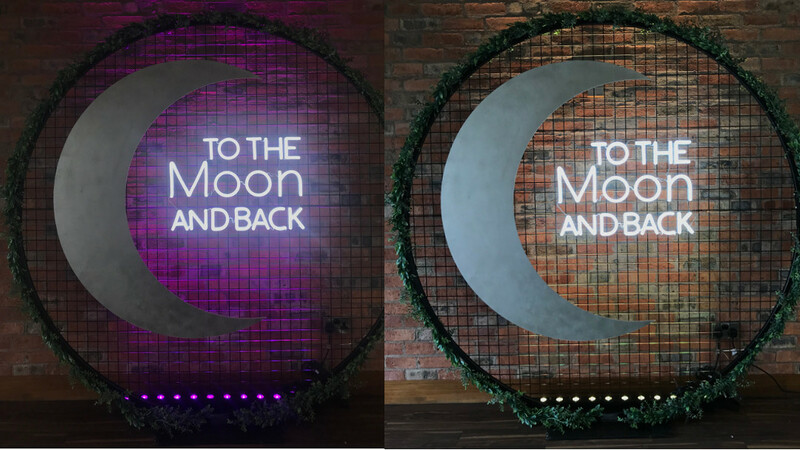 Illuminated with clear sparkle bulbs to offset the industrial look you can even change the colours to suit your theme. 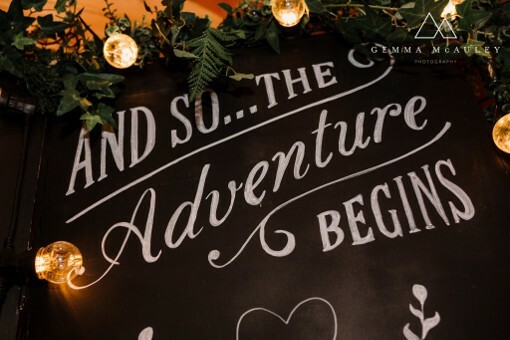 Our Chalkboard Wedding Backdrop has been in the planning for a while, we wanted to get it perfect and chose the most perfect sign wirter to use the quotes we have chosen and original designs. 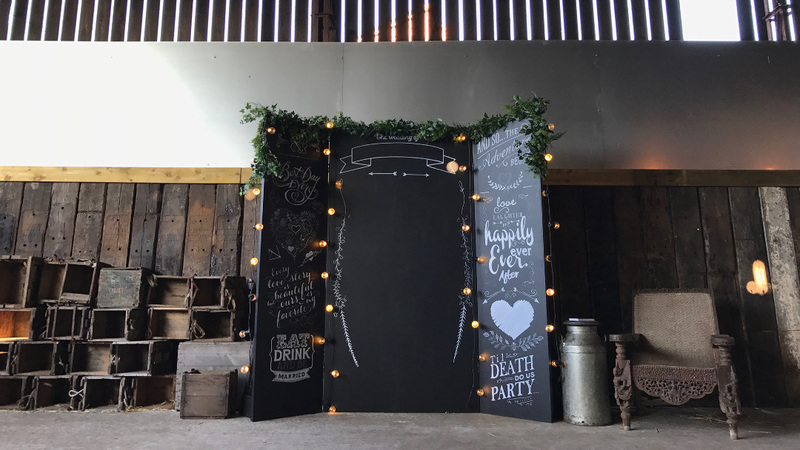 Fully designed by us and is a one off, we made this 7.5ft blackboard with folding doors for the wedding reception. Placed in the entrance or a lonely corner it can be a fun place to have your photograph taken, place some props and you’ve got yourself your own photo booth! Can be personalised with your name and date. Now this is a Wow seeker if ever I saw one. 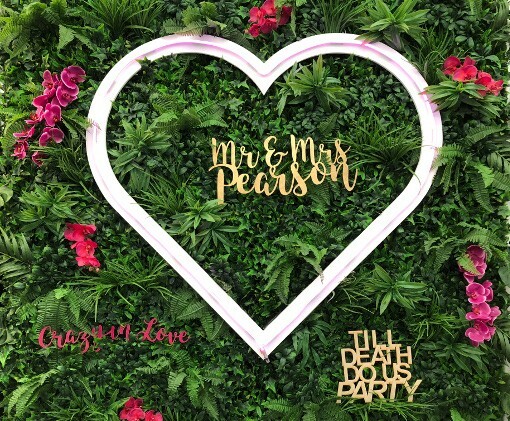 Our new Faux Foliage Backdrop is PERFECT to add colour and a modern twist to your wedding or event. Hired on its own and you can hang your table plan or photographs from it. 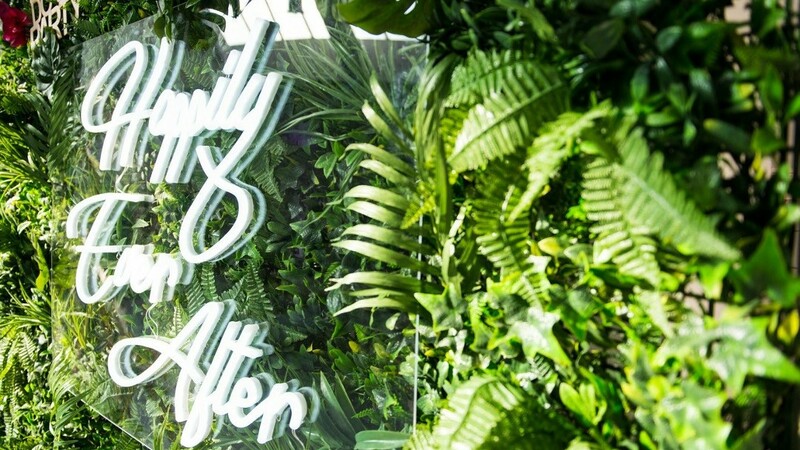 OR customise it with any NEON (Check out our Neon Backdrops page, coloured flowers, any Custom Signage, Song lyrics, your new surname! The possibilities with this green eyed wonder are endless. Anything can be added to it if you provide it, including pink flamingos, shells, any props! 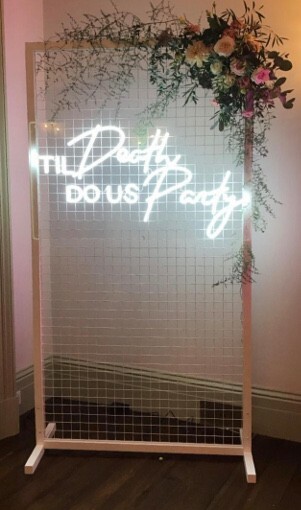 Our white Mesh Backdrop can come in one or two panels, i will always quote for one. 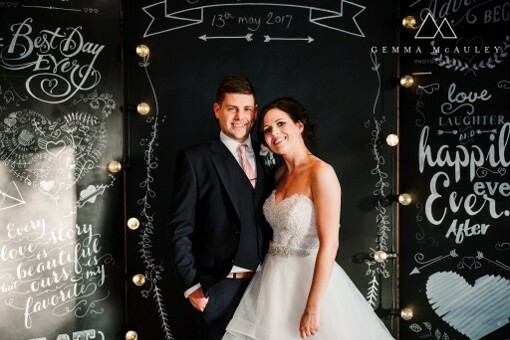 Its a minimalist and modern wedding backdrop which can personalised and used however you like, use it to hang one of our neon wedding signs, laser cuttings, hang a table plan or any perspex or acrylic signage. made even more stunning with a corner floral piece or one of our faux garlands. It can be used with Decadent red flowers, add neon or uplighters behind for more of a theatrical look. 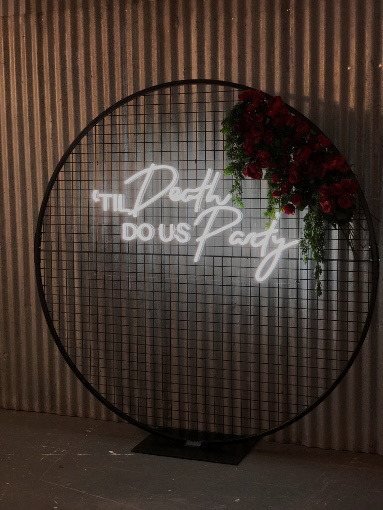 Our black mesh circle backdrop is dramatic, and versatile, Add a chair in front for group pictures, Add it to the top of a ceremony aisle, or behind a top table. Super Sturdy with a welded metal base plate.